By Sarah Browning, Extension Educator, Lancaster Co. Correct timing on your pest control measures is key to good control, but that’s difficult when insect or disease symptoms don’t show up until much later in the growing season. Three common pest problems on evergreen trees include Zimmerman pine moth, diplodia tip blight and dothistroma needle blight. They are listed below in order of timing for control. Now is a good time to scout for problems in your trees and prepare for control, if needed. Zimmerman pine moths are serious pests of pines in Nebraska. Their larvae, which are caterpillars, damage trees by tunneling just beneath the bark of the trunk and branches — most commonly on the trunk just below a branch. The tunnels they make can girdle the trunk or branches or physically weaken them so they are easily broken by wind or snow. Heavily infested trees are often deformed and are sometimes killed. The first sign of infestation by pine moths is the appearance of soft, pinkish-pitch masses on the trunk or branches. These pitch masses, which form where larvae are feeding beneath the bark, may be found anywhere from the top to the bottom of the tree and commonly look like masses of bubble gum. After the larvae finish feeding, the pitch masses dry and become light yellow to cream colored, hard and brittle. The pitch masses may remain on the tree for many years and may not be noticed unless the tree is examined closely. Ponderosa, Austrian and Scotch pines are highly susceptible to pine moths. Jack and white pines can be infested, but are usually not seriously damaged. Pines from 5–15 feet tall are the most heavily infested and damaged. Smaller trees are less frequently attacked. Larger trees are often heavily infested, but they are not likely to be severely damaged. Young larvae, which hatched out last fall and spent the winter under loose bark scales or in old tree wounds, are susceptible to insecticidal control in spring. Spray bark on the tree trunk and base of main branches with a drenching spray of permethrin or bifenthrin in the second week of April and again the second week of August. This fungal disease of Austrian and Ponderosa pine kills current-year shoots and, in years with heavy disease pressure, can kill whole branches. It’s most common and damaging in mature trees, but young trees can be affected, too. The most conspicuous symptom of Diplodia tip blight is stunted new shoots with short, brown needles still partially encased in their sheath. Infected shoots are quickly killed and may be located anywhere in the tree’s canopy, although damage is generally first evident and most severe in the lower branches. After two or three successive years of infection, a heavily infected tree’s canopy may be extensively damaged. Repeated infections reduce growth and deform trees. Branches that have been infected several years in a row often die back completely. Small, black, pimple-like structures develop at the base of infected needles and on the backside of pinecone scales. These structures produce additional fungal spores that can re-infect the tree. Spray branch tips thoroughly when new growth starts, just before needles emerge from sheaths — usually around the third week of April — and 7–14 days later according to the label with thiophanate-methyl (such as Cleary’s 3336 or Fungo), propiconazole (Banner MAXX), copper fungicides or Bordeaux mixture. Also improve tree health by mulching with wood or bark chips and watering about 1 inch per week. Avoid overwatering. One of the most common fungal diseases of pines in Nebraska is Dothistroma needle blight. This disease is responsible for much of the premature needle drop that occurs in windbreaks and ornamental pine plantings. 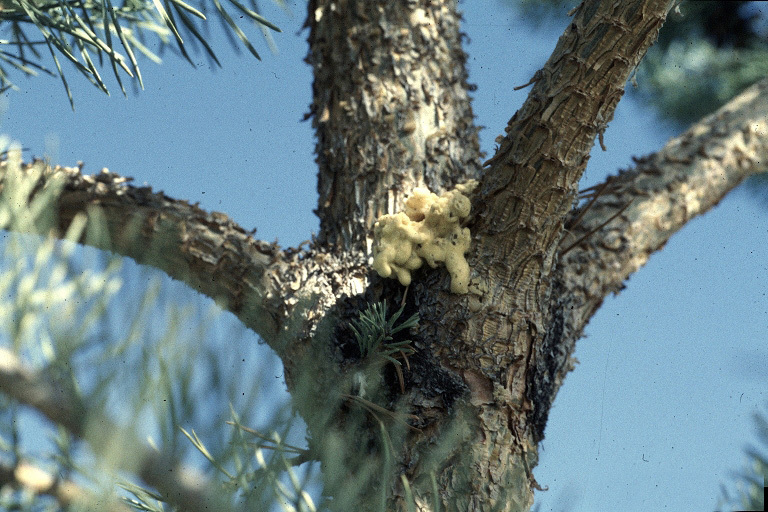 Twenty pine species are affected by this disease, but in the central and eastern U.S., the fungus is found most commonly and causes the greatest amount of damage on Austrian and Ponderosa pine. Initial infection of the tree by fungal spores occurs during rainy periods from May to October. Germinating spores enter the needles through natural openings and the infection process begins. Symptoms appear about three to four months after the first infection, usually becoming visible in late fall. Symptoms are seen as yellow or tan spots on needles of the current year’s or older growth. These spots darken and become brown or reddish-brown then spread to form a band around the needle. These bands are often bordered by a yellow, chlorotic ring on each side. The fungus grows within these tissues, killing that portion of the needle beyond the lesion. Initially, the tip of the needle dies while the base remains green, but eventually as the disease progresses, the base of the needle also dies, and the entire needle drops off the tree. Typically, clusters of needles within a shoot are infected. Lower branches of trees are most severely infected, although the entire tree can be affected. Usually the greatest amount of needle drop is seen in the late spring or early summer following infection. Spray trees with copper fungicide or Bordeaux mixture as needles are emerging (mid May) and after new growth has occurred (mid to late June). Increasing air-flow around the healthiest trees by removing older, declining trees will also reduce disease pressure.